The Doug Morrison Award is given in memory of Doug Morrison to an Arizona Biologist in a non-supervisory position who has made significant contributions to the management and conservation of wildlife in Arizona. This Award exemplifies the dedicated work ethic of the Chapter’s former President and U.S. Forest Service Biologist, Doug Morrison. Contributions are in areas of wildlife research, education and training, management, or law enforcement. This year, the Doug Morrison was presented to Brenda Strohmeyer. 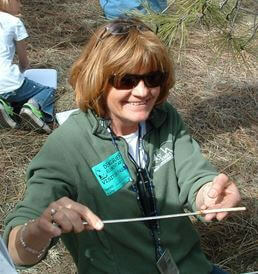 Brenda is currently employed as a supervisory biological technician at Rocky Mountain Research Station in Flagstaff. In particular, I nominate Brenda based on her participation in the Flagstaff Festival of Science – one of the best events held in Flagstaff. It is a huge event in the Flagstaff community and takes an enormous amount of work to organize. Not only does Brenda represent the Rocky Mountain Station at the festival (including organizing and persuading RMRS scientists to participate), she sits on the board and currently serves as Secretary. Her work is integral to the success of the festival. In addition, Brenda is involved in several other educational outreach programs Camp Colton; Greenhouse for School and Community Projects; In School Programs and Educational Kits; County Fair; Eagle Eyes Family Science Day; and More Kids in the Woods – Flagstaff in the Woods. 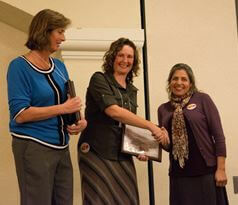 This year, the Professional Service Award was presented to Heather Bateman from Arizona State University. Heather Bateman from Arizona State University, has worked tirelessly above, and well beyond her call with little recognition besides a “thank you” here and there from her students. While teaching at ASU as a professor and coaching a few graduate students, she is also conducting her own research and developing an “app” that would make it much easier for biologists to collect morphometric measurements from reptiles. The main reason for Heather’s nomination is her involvement with coaching ASU undergraduate students and encouraging them to be highly involved with TWS. By developing young students, she has insured a future for wildlife conservation. She has worked very hard to get students to TWS conferences. Due to her leadership, ASU led a team of quiz bowlers for the first time to the TWS National Conference in Milwaukee. She is an exemplary biologist living to the highest standards of our profession. This year’s Conservation Award was presented to Randal Babb. Randy Babb is currently the Arizona Game and Fish Department’s officer in charge of the Watchable Wildlife Program and was formerly Information Officer for Region VI in Mesa. While serving in these positions, Randy has done an exemplary job of keeping the public informed on wildlife issues and developing information and education programs for public consumption. However, the main reason for Randy’s nomination is his more than 30 years of professional wildlife contributions, off and on the job. It is Randy’s accomplishments outside his assigned duties that make both his work so valuable. Randy can rightfully be called Arizona’s foremost naturalist as his off duty time is spent studying wildlife and investigating animal biogeography, behaviors, status, and relationships. 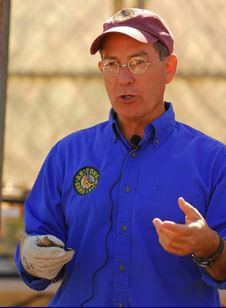 Randy’s knowledge of the natural world includes botany, mammalogy, ornithology, and, above all, herpetology. Randy has published authoritative articles on everything from arachnids and insects to sandhill cranes and including an identification guides to fishes, amphibians, and reptiles. He is generous with his time, willingly volunteering for conservation orientated programs, and wildlife projects. Randy also devotes countless weekends to camping with college students from ASU and UA and his ability to communicate complex wildlife issues in an understandable manner has made him a mentor to many of them. These weekends are among the most memorable college learning experiences for young wildlifers in that the lessons learned not only enrich their academic experience, their innovative presentation is such that they last a lifetime. Finally, Randy is a superb illustrator, and has created our new logo for the AZTWS. 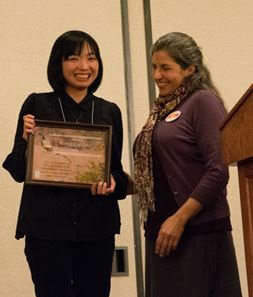 Hsiang Ling was the recipient of this year’s Roger Hunger- ford Award. Hsiang Ling arrived at The University of Arizona from her M.S. work in Taiwan where she worked hard to achieve an exceptional academic record, gain an incredible amount of experience, and earn the reputation among faculty as their most outstanding student. Hsiang Ling is hard working, dedicated to conservation issues, and a superb intellect. Her PhD work involves the impact of roads on wild- life and is an intellectually challenging dissertation that she has embraced with passion and determination. The results of Hsiang Ling’s doctoral work permit informed management and conservation decisions. Hsiang Ling used two tree squirrel species (federally endangered Mt. Graham red squirrels and Abert’s squirrels as model organisms for the assessment of road impacts. She has presented her research at 14 professional conferences related to wildlife, conservation biology and road ecology. She has been incredibly productive, and is keen to share her findings with land managers as well as basic scientists. Finally, her ability to engage and passion to make a difference is at the core of her successful and wonderful persona.